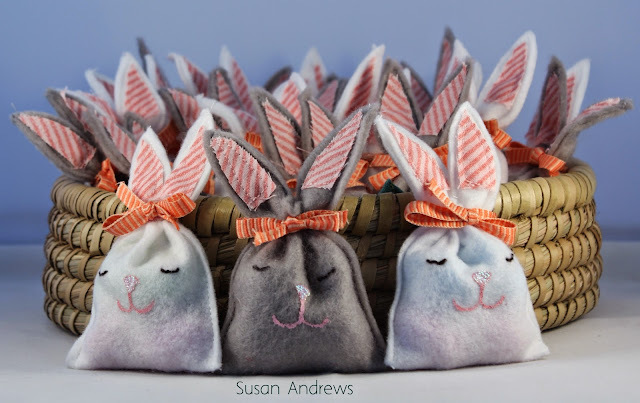 Tis the season for bunnies, eggs, and all sorts of goodies; which in turn has brought me to these wonderful little treat bags. My daughter loves Pinterest, hence she and has got me to check things out from time to time, as I am always on the look out for simple, fun projects to share. Without a doubt these adorable bunnies made for the perfect Easter treat. The creator of this project generously provided the template for these little critters. Fortunately with shrinking the original template, the pattern ended up being the perfect size for my purpose. This not only allowed me to cut out four bunnies from each piece of felt, but it still provided enough space for a reasonable amount of candy.